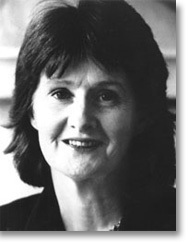 Eavan Boland was born in Dublin, Ireland, in 1944. Her father was a diplomat and her mother was an expressionist painter. At the age of six, Boland and her family relocated to London, where she first encountered anti-Irish sentiment. She later returned to Dublin for school, and she received her B.A. from Trinity College in 1966. She was also educated in London and New York. Her books of poetry include New Collected Poems (W.W. Norton & Co., 2008), Domestic Violence, (2007), Against Love Poems (2001), The Lost Land (1998), An Origin Like Water: Collected Poems 1967-1987 (1996), In a Time of Violence (1994), Outside History: Selected Poems 1980-1990 (1990), The Journey and Other Poems (1986), Night Feed (1982), and In Her Own Image (1980). Boland and her husband, author Kevin Casey, have two daughters, and she is currently a professor of English at Stanford University where she directs the creative writing program.